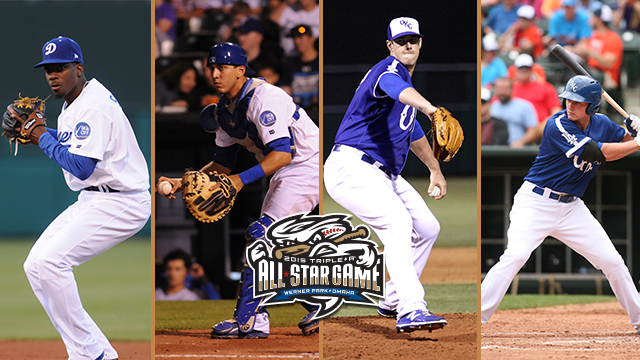 Darnell Sweeney, Austin Barnes, Ryan Buchter, and Corey Seager will participate in the 2015 Triple-A All-Star Game on July 15. OKLAHOMA CITY - Four Oklahoma City Dodgers have been named Pacific Coast League All-Stars and will participate in the 2015 Triple-A All-Star Game Wednesday, July 15 at Werner Park in Omaha, Neb. Austin Barnes was elected as the PCL's starting catcher, and Darnell Sweeney was elected as the starting second baseman. Both relief pitcher Ryan Buchter and shortstop Corey Seager were named reserves by the PCL. The Dodgers are tied with the Round Rock Express for the most representatives on the PCL All-Star roster, and it marks the first time ever four Oklahoma City players have been named to the Triple-A All-Star Game. The quartet will be joined by hitting coach Franklin Stubbs, who was previously named to the PCL's coaching staff. Barnes has established himself as one of the top catchers in the PCL this season, batting a team-leading .302 with five home runs and 29 RBI. Barnes has an equal amount of walks to strikeouts (22), and has posted a team-leading .382 on-base percentage (T-10th in PCL). Behind the plate, he's currently sixth in the league with a 32.5 caught stealing percentage. Barnes, 25, is in his first year in the Dodgers organization after being acquired in a trade with the Miami Marlins in December. He made his Major League debut May 24 and played in five games with the Los Angeles Dodgers before rejoining Oklahoma City in early June. Sweeney currently leads the PCL with 25 stolen bases. Serving as the team's leadoff hitter, he also leads OKC with 82 hits (6th in PCL), 25 multi-hit games, 39 runs, 20 doubles, 25 walks, and ranks second with 31 RBI. The versatile defender has started 33 games at second base, 23 in center field, and 11 in left field. The 24-year-old Sweeney was selected by the Dodgers in the 13th round in the 2012 draft from the University of Central Florida. Considered one the top prospects in all of baseball, Seager has made a seamless transition to Triple-A since getting promoted to Oklahoma City on May 1. In 52 games with the OKC Dodgers, Seager is batting .290 with six home runs, 14 doubles, 31 runs, and 25 RBI. On May 28 in Salt Lake City, he became just the second player in OKC history with six hits one game, going 6-for-6 with a home run, two doubles, and six RBI. The 21-year-old shortstop was taken with the 18th overall pick of the 2012 draft by the Dodgers from Northwest Cabarrus High School in Concord, N.C.
Buchter, 28, has been a key piece of the OKC Dodgers bullpen all season, and the lefty has only been scored upon in one of his 23 appearances. He currently owns a miniscule 0.63 ERA and .175 opponent average to rank best among PCL relievers. He has recorded two saves and is second in the league with eight holds. Buchter is in his first year in the organization after signing as a free agent last December. The Triple-A All-Star Game will be broadcast live on MLB Network, the American Forces Network, and the Triple-A All-Star Game Radio Network at 7 p.m. Central time. The game will be carried locally on AM 1340 "The Game." The Dodgers are currently in Memphis but will return home to begin a four-game series against the Omaha Storm Chasers Saturday, July 4 at 7:05 p.m. The Dodgers will celebrate Independence Day with postgame fireworks. Limited tickets remain for Saturday's game, and tickets for the other three games of the series are available through the box office on S. Mickey Mantle Drive, by calling (405) 218-1000, or ordering through okcdodgers.com.